Health workers in DRC are working round the clock to contain the latest Ebola outbreak. Kampala — Uganda will today, and for the very first time, start vaccination against the deadly Ebola haemorrhagic fever (EHF) as a preventive measure against the disease that has ravaged neighbouring Democratic Republic of Congo (DRC). Dr Jane Ruth Aceng, the Health minister, said only healthcare and frontline workers in the five high risk border districts who are prone to infection with the virus will receive the rVSV vaccine, starting today. "As a neighbour to the DRC, Uganda is on high alert due to the high risk of the Ebola threat," Dr Aceng said on Friday. Dr Aceng also reiterated that there is no confirmed Ebola case in the country and an active case search continues in all communities, health facilities and at designated and informal border crossing in all districts. The five districts identified by the government as most at risk include Kabarole, Bunyangabu, Kasese, Bundibugyo and Ntoroko. Ebola broke out in DRC's north-eastern provinces in August and has killed close to 200 people and spread to areas close to Uganda. 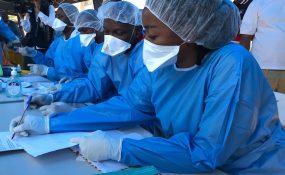 A thriving cross-border trade and social movements and events between relatives living on either side of the frontier has prompted the government to strengthen screening amid fears the deadly hemorrhagic fever could spill over into the country. As of November 1, the DRC had registered a total of 285 Ebola cases, 250 confirmed and a total of 180 deaths. Another 41 suspect cases are under investigation. Dr Yonas Tegegn Woldemariam, the WHO representative in Uganda, said the vaccine is safe with an efficacy level of 90 per cent and starts working within 10 days from the time it's administered. It remains effective in the body for the next 12 months, he noted. "There are no major risks recorded up to now. Once one is vaccinated, there could be just a normal reaction and that's why we follow up those who have been vaccinated," Dr Tegegn said. He also explained that the vaccine has been limited to a given portion of the population because it's very scarce. A total of 2,100 doses of the vaccine donated by the US-based Merck Company through WHO are already in the country. Other African countries which have used the same vaccine include Guinea and the DRC. The Ebola virus belongs to the Filoviridae family (filovirus) and is comprised of five distinct species: Zaïre, Sudan, Côte d'Ivoire, Bundibugyo and Reston. According to the World Health Organisation, Ebola virus is transmitted by direct contact with the blood, secretions, organs or other body fluids of infected persons.